MissMuffcake: Vegan Celebrations - Let's Celebrate With A Giveaway! CLOSED!!!! Vegan Celebrations - Let's Celebrate With A Giveaway! CLOSED!!!! I love Alicia C. Simpson's books! Her writing and recipes are fun, creative and take the guess work out cooking vegan food that comforts the soul and stirs up fond memories. 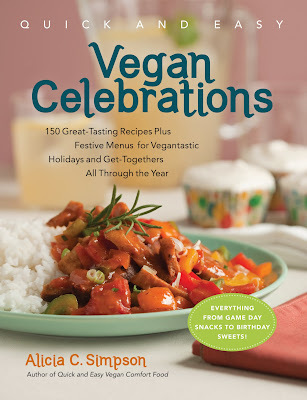 My friend recently sent me her second book Vegan Celebrations and since he was so generous I bought a copy to giveaway! From game day party planning to throwing a awesome holiday feast this books has you covered. From nachos to a mushroom brisket - the recipes deliver many fun ways to celebrate - even if you are just celebrating a good meal! This contest is open to everyone. 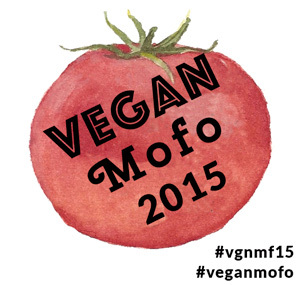 All you need to do is respond to this post with your email address and answer what your favorite vegan party food is! Contest closes on Monday January 31 2011. I will draw one lucky winner randomly! I will notify the winner by email that day! My favourite party vegan food is Hijiki stuffed mushrooms. One of my favorite cookbooks! I love the mac n cheeze, my favorite recipe!!! My favourite vegan party food is imitation crab cakes (chickpeas!). Yum! For potlucks, Alicia's mac'n'cheeze recipe is always a hit, with vegans and omnivores alike! I love making vegan spinach dip! Yay for giveaways! I think my favorite party food is hummus. It's not a party until the hummus arrives! My favorite party food was cauliflower that someone had brought and it was baked or fried with tahini and I don't know what else. The tahini and stuff formed a coating like a breading. It was the most amazing thing ever and I really wish I knew how the person prepared it. I'm sending to you for the Vegan Valentine's Day Treats swap, so just nosing around and saying hi. :) I like your blog. My favorite vegan party food is Alicia Silverstone's vegan cheezy guacamole dip with black beans, vegan sour cream, daiya cheese and so much more! Thanks for doing the giveaway! I have her first book and love it. My favorite vegan party food is currently guacamole since I made it for the 1st time last week and was so proud of it. My default party food is hummus & pita chips - everyone likes hummus! When I have more time I like to make things with puff pastry. Puff pastry makes everything delicious. Veg pigs in a blanket! Hummus and chips. And cookies, cookies, cookies!! Guacamole just can't be beat! My favorite vegan party food is fresh, homemade guacamole and thai spring rolls. My favorite thing to serve is vegan cupcakes or truffles, because I love making them, eating them, and sharing them! I just had a party and made spinach dip and it was a huge hit! It is best with close friends so people don't have to worry about spinach in their teeth! I make this roasted red pepper dip that everyone says tastes like there's cheese in it... That with some good old fashioned potato chips is the best vegan party food! I looove vegan spinach & artichoke dip! My favorite vegan party food is chili! My fav vegan party food is stuffed mushrooms or spring rolls. So good! Black bean dip or hummus with salsa.